SMART CUSTOMERS, STUPID COMPANIES pulls no punches. Dynamic and a quick read, this full color book focuses like a laser on disruptive innovation and what it takes for a company to profit from it, instead of getting crushed by it. 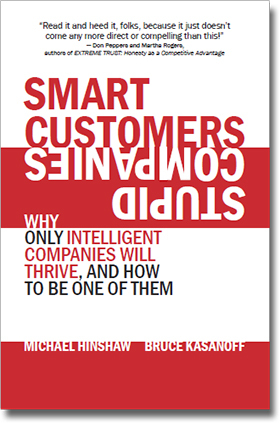 The book makes the case that four disruptive forces are making customers smarter than the companies that wish to serve them, and that being dumber than your customers is not a sustainable business model. Michael Hinshaw and Bruce Kasanoff argue that 25% to 30% of Fortune 500 CEOs are running the next Kodak, but they don’t know it yet. They’ve been lulled into complacency because it has taken two decades for technology to reach a tipping point. In 1995, or even 2005, technological change wasn’t capable of toppling governments. Now it is. 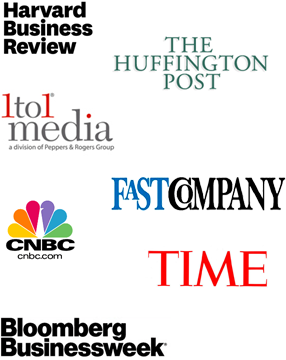 In 2000, the biggest media companies in the world hadn’t lost control of their business models. Now they have. Major companies are so far behind their customers’ expectations that almost a third of them will never catch up. This book is for those companies who can still survive – and even thrive – if they act decisively and be utterly tenacious in their conviction to act as smart or smarter than their customers. “Technology-enabled customers are getting smarter every day, while companies mired in the same old ways of doing business just come off as stupider and stupider. Do not let that happen to you. How smart are your customers? If your company is like most, they’re likely smarter than you realize. How smart, you ask? It is not a sustainable strategy to act dumber than the customers you wish to serve. At the same time, everything and everyone has become or is becoming interconnected. Customers have smartphones loaded with apps that let them check prices, compare service agreements, read reviews, and check in with friends (and strangers) even as they examine your offers and products, and those of your competitors. Consumers and businesses alike research, connect, and purchase online and over their phones without a second thought. With these tools come radically higher customer expectations. Higher expectations of experience. Greater demands for personalization and customization. Lower tolerance for mistakes, for running through inane hoops, or for interactions that require mindless repetition (“... What is your account number ...?”). In short, the world has changed dramatically, but many companies have not. Forget about innovation, they’re not even sure how to keep up. This is the challenge that your company needs to confront. Companies that can’t pass basic tests of memory, flexibility, responsiveness, and innovation will die. Among the many disruptive forces that are making it impossible for firms to survive with outdated strategies, four in particular are changing the basic ground rules for business competition and are the focus of this book: Social Influence; Pervasive Memory; Digital Sensors and The Physical Web. Together, these forces will bring customers more choices, better information, and stunning new services. They are already providing individuals with tools more advanced in many cases than the most sophisticated commercial enterprises had just five years ago. Put another way, they’ll continue to make your customers even smarter. We’re just at the tip of this revolution. For reasons that will become crystal clear as you read this book, established firms will need to reinvent themselves and disrupt their own industries to stay alive. With thousands upon thousands of very bright developers and entrepreneurs working around the globe to provide your customers with ever better, ever more disruptive tools, it’s a certainty that innovation will be coming to your industry if it hasn’t already. Those companies who react slowly or tentatively will be increasingly marginalized, until finally, they’ll wither away. 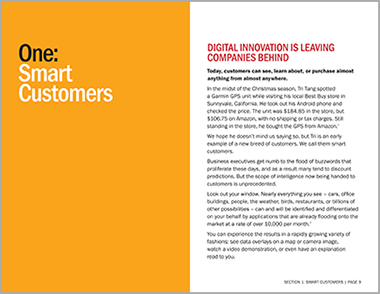 It may take five, ten, or even fifteen years, but eventually, these companies will be smothered by the competition and the growing demands of their ever-smarter customers. Does your company behave stupidly? Does this mean the end of loyalty? © 2013 by Michael Hinshaw and Bruce Kasanoff. All rights reserved.